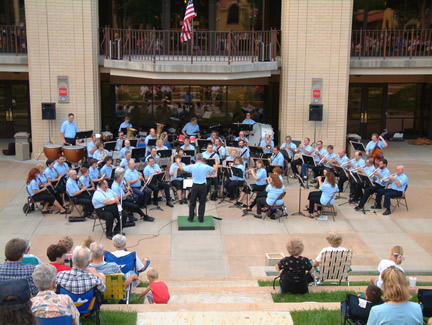 The Pueblo Municipal Band performs outdoors during the summer at PCC. Pueblo's Municipal Band has been playing every summer since 1913. Concerts are scheduled for several Sunday evenings in the summer at Pueblo Community College's amphitheater. As part of our educational mission, the Pueblo Municipal Band actively promotes an apprentice program where advanced high school and university music students, upon recommendation of their teachers, receive rehearsal and performance experience at a professional level. Positions in the apprentice program are also extended to experienced senior musicians, as openings permit and upon the recommendation of the conductor and executive director. There are no salaries for Administrators or members of the Board of Directors, only a small stipend to reimburse the professional musicians for their time and travel expenses. Money is used to help fund the band's traditional, 8-concert summer series, purchase new music, and as a long term goal, purchase of percussion instruments to include tympani and bass drums with stands. We're also looking to extend the series throughout the year to play seasonal concerts and perform at extended care facilities throughout the South-eastern Colorado region.